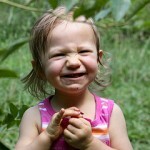 Blueberry Smile: Emily had her first blueberry picking experience. Rachelle and some friends took her, and she was fascinated by it. She was amazed to find those tasty blueberries on the bushes and even on the ground. When she discovered that Mommy was putting th blueberries in her bucket, Emily decided to carry the bucket around. She also made friends with another little boy who was picking blueberries and then feeding them to Emily. This entry was posted on July 21, 2008 at 3:02 am.